Twitter’s age requirements are a bit hazy and they don’t ask for your age when you set up an account, but their basic terms do state you must also be 13 years of age. I know the photo is meant to be funny and sarcastic even, but if your eight year old is on Facebook and Twitter, not only are you in violation of their terms, but it’s also your own fault for allowing your child to sign up. If your 8 year old has a phone or iPad, it’s also your fault because you are the one that allowed them to have it and you bought it for them. And it’s really sad to think that your child lacks imagination. Again, I blame the parent. Instead of the phone or iPad, you could have bought them the coloring book and crayons that you had as a child. Chances are you have a phone and/or iPad too, and kids love to mimic their parents or grow up to be like their parents. When was the last time you sat down and colored a picture on a piece of paper with crayons with your child as opposed to playing a game with them on the tablet or computer? 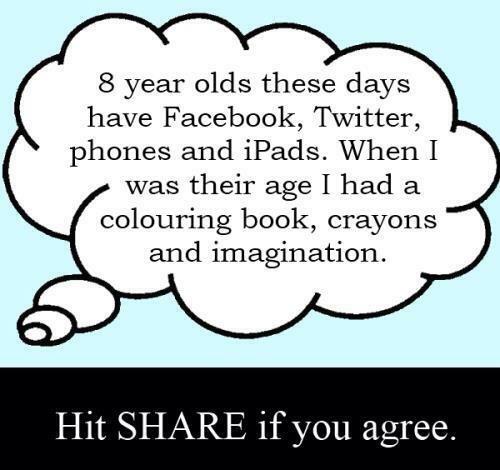 These days, 8 year olds don’t really have these things unless the parents allowed them to have it. These things are not privileges just bestowed upon your children because of the day and age they live in. They didn’t pop out of the womb while texting. True, they would be anomalies of your own childhood but you can thank a growing age of technology and advancements in society for such things that you have today to entertain you and your children. Would you trade them all to be able to go back in time with your child and give them the childhood you had? Probably not. Would you give up Facebook and take up a pen and paper to write letters and send birthday cards via the U.S. Postal Service to keep in touch with your family and friends? No. Would you pick up that black rotary dial phone hanging on the wall to call someone and tell (tweet) them something. Nope. Would you settle for playing Oregon Trail on a floppy disk on a green screen Mac? Maybe…it was pretty fun. But my point is this picture makes it sound like your 8 year olds are privileged to have these things, and guess what? They are. But you were privileged too as a child to live in a free society such as ours that allows us to have such wonderful things. Sure, the things you had as a child were different than what your children have today, but imagination is still the same. Your child today might imagine something different than you did way back when, but it still works the same. So to think your child doesn’t have that one simple thing that hasn’t changed makes you an idiot in my eyes. And if your child is using Facebook over imagination, again, that’s your fault. So both of you should put down the iPad, wipe the saliva off your chin and go outside and play. There is a world of imagination waiting out there. And afterwards, instead of plugging yourself back into the world wide web, go buy a deluxe box of 72 Crayola crayons and make art together. Facebook can wait. It’ll be there when you get back. Go share a memory instead of a meme.